We can’t have a farm without dogs!!! Lana had always been enamored of rough collies, so Luna came to live on the farm. Collies, herding dogs as they are, can be avid car-chasers and Luna is no different. We fenced in our back yard and she happily chases squirrels out there and hides bones in the raspberry bushes. Because we live on a quiet country road, she does get time out of her back yard to go for walk most days. 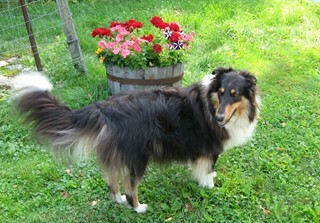 Luna is Lana’s favorite collie color – tricolor – which is black and white with sable touches. 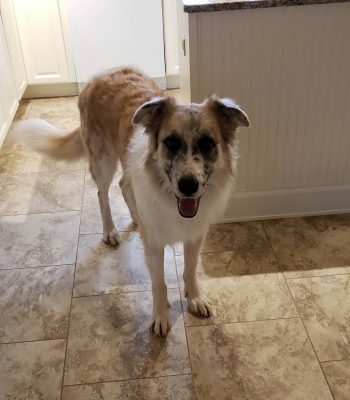 Luna is wonderful in the house and is very respectful of the cats, though she would steal their food if she got the chance! As she has gotten older, she is not as patient with the kittens, but never hurts them, just shows them her teeth by lifting her lip. Kittens understand and give her the space she needs. Luna in the back yard. When we lost Teddy Bear, Luna was depressed, and we were too. So we went back to Big Fluffy Dog Rescue to see if they had another Great Pyrenees mix available. 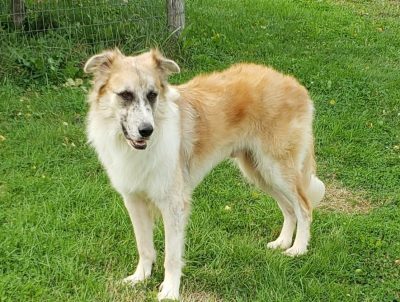 I had admired a collie/Pyr mix that they had online, but he was already adopted, so they found me another similar dog, named Shelton. Big Fluffy had sprung him from an Alabama shelter and he was in their kennel in Tennessee. He rode the transport to Connecticut and we picked him up from there. Shelton is a big boy who is very affectionate, likes other dogs, ignores the cats and is afraid of the alpacas. After looking at him for awhile, we doubted that he had much Great Pyrenees in him, but did think he must have some big dog in there to make him so long and tall. 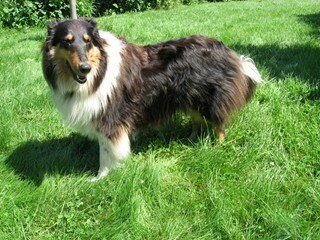 He also moved like a German Shepherd, but had the sable and white colors of a collie. DNA said he was 37.5% Great Pyrenees, 37.5% German Shepherd Dog and 25% a mixture of herding dog breeds. He’s one sweet boy and Luna is much happier with him, though she makes it clear she’s the alpha dog. Shelton in the back yard. Many alpaca farms find that some type of fowl helps with bug control. We didn’t want any noisy Guinea fowl, or loud and sometimes mean Geese, so resisted getting birds for awhile. But after seeing how the black flies and other bugs bothered our alpacas, we found the perfect breed of Ducks! 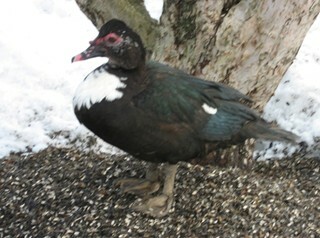 We adopted three Muscovy Ducks, named Peter, Paul and Mary, who proceeded to produce many, many offspring. They became too much, so we sold the flock and kept two males to help with the bugs. One of them has since passed, so our only one left is ‘Gimpy’, who broke his foot as a duckling, but is still doing ok in his old age!